- In a bowl whisk the eggs with sugar until the sugar dissolve, then add the orange zest and orange juice give it a quick whisk then add the oil and another quick whisk . - Seft the flour, add it into the liquid mixture in two phases, first 1 cup of flour with the baking powder and whisk till you get a smooth mixture, then add the remain 3/4 flour to the mixture and whisk untill you have a smooth cake mixture. 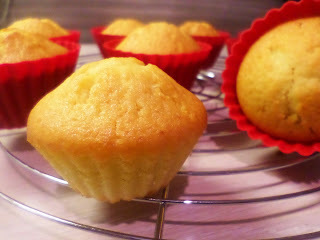 - Fill 3/4 of the cupcake molds with the cake mixture. - In a preheated oven 180°C bake the cupcakes for 25 minutes . - Serve it with tea or coffee. how many cupcakes will this mixture make?